My daughter has absolutely loved her pantomime rehearsals. Every day, she gets into the car and tells me so much about what she’s done. I wish I could bottle her enthusiasm. I also wish I could share all her thoughts and observations on the blog, but I can’t write while I’m driving! I asked her to share her memories of the rehearsals here. Her account lacks that enthusiasm, but she managed to remember exactly what she had done on every one of her first two weeks of rehearsal, which is pretty impressive! I can’t remember what I did yesterday. Or even an hour ago. On the first day, we learned the first dance. It was hard to pick up at first, but at the end I was starting to know it. On the next day, we learned another dance and had costume fittings and got to see some of our costumes for the first time. I saw the dame’s funny hat and lots of funny wigs. The third day was just going through the two dances we’d learned. By the end I knew them quite well. The next day we met the adult characters. They were singing and we were dancing to their singing, rather than the recorded music. On Friday, we did the same again and learned the bow and the moves for the very end of the show. On Saturday of the first week we did some acting for the first scene. I found out that I was going to have a line, which I auditioned for with the other small girl from the chorus. On Monday of the second week we learned a fairy dance, which the tallest girls and the very smallest girl in the chorus won’t be doing. On Tuesday it was decided that I would share the line with the other small girl from the chorus and we went over the dances. On Wednesday I got my script and found out I had two more lines and I had to do a bit of acting. On Thursday I found out I had another acting part with the other girls from the chorus and I have to make some funny ‘dying’ noises. This is when I got the splinter in my leg from crawling off the stage. I’ve got the main part in this bit. On Friday we did a run-through of all the acting parts and we did some other scenes. On Saturday we did a full run-through on the stage, with the scenery behind us. She has worked so hard and learned so much in such a short time. She is so excited about it and so am I! The pantomime opens this weekend and I can’t wait to see it. 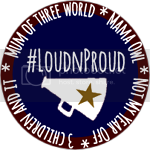 Linking up to Loud ‘n’ Proud with Mama Owl. Thanks very much! They do work extremely hard! It’s a big commitment, but they get so much out of it. Yep, it’s open now! It’s on for five whole weeks. It’s a really big deal for her (and for the rest of us! ), but I know she will take it all in her stride. She’s loving it so far! It’s great that you have fond memories, it shows that it’s worth the commitment and hard work! How wonderful, what a great experience this will be for her. I remember acting in pantomimes when I was young, it was so much fun! I’m pleased she is enjoying it. Thank you for sharing with #LoudnProud! Thanks very much, she’s having the best time! I used to act when I was young and loved it, but I could never sing or dance!